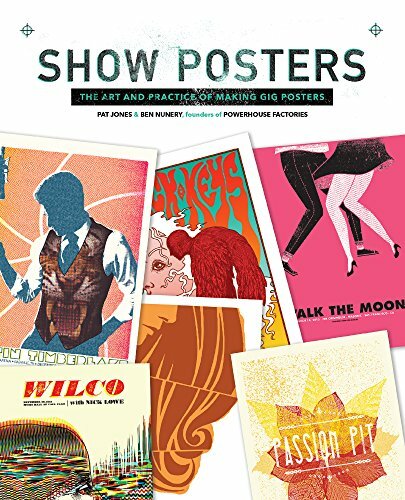 This is an enlightening book that talks about how gig posters are produces, the tools required, approaches and trends. For graphic designers starting out, this could be quite insightful. Most of the poster examples showcased are actually still created digitally, which is why there's a chapter on the physical equipment that are required. There are only four chapters. First chapters provides a brief history in poster making dating back to the mid-1800s. And the last chapter features interviews with other artists that create gig posters. The interview talks about how you can work with bands, the different companies surrounding the bands, and includes career advice on breaking into this industry. The artists interviewed are Andy Vastagh, Travis Bone, Lil' Tuffy, Aaron May and Matt Barnes. Overall, it's quite an insightful book authored by Pat Jones and Ben Nunery from Powerhouse Factories, a rock poster shop and design studio.